Not having the financial means to see an optometrist at a regular practice, I was told about the St Johns Eye Clinic. I started going there in 2002 and they were fantastic. Great equipment and good staff. But, as with all things community driven, it became bad – and sad. Last year I was rushed through my appointment by a sullen optometrist who was cross with people not showing for their appointments. Her rushing resulted in an incorrect script for the left lens. My long distance sunglasses had the left lens changed, but over and above that, the lenses were cut too small and keep dropping out. My computer glasses were also incorrect and that pair had to be fixed. Another eye examination later, and my transition lenses were sent away – but with the wrong script – the optometrist had not written down the new one! And so they too were ‘fixed’ but the single lens replacement means they no longer transition properly. Despite all this frustration I went back again this year, but chose to see another optometrist. This young lady chose not to listen to me when I told her I could not see – she was happy for me to guess the letters! So of course, the end result was that my script was wrong. I went back to sort it out and she treated me like a second class citizen. Now, I am twice her age (about) and well educated, and yet she managed to humiliate me. I can only imagine how the uneducated people who see her feel when they walk out. I chose to get a second opinion and not only was the script wrong, and the angle of the lens incorrect but the lenses themselves had been seated incorrectly. It sounds as if the lens maker is not the best there is. I asked for a refund as I did not want to go back to sort it out given the way I was treated and because it is clear that their manufacturer is not the best. Well, that was a battle. But thankfully we have a good Consumer Protection Act in this country – and it supersedes everything. Refund done and dusted and new glasses being ordered through a new optometrist, and lens maker – albeit at three times the price. While I wait for the new glasses to be ready for me, I am doing as little as possible near sighted and computer work! I had the day off work and I chose to make this risotto for lunch. Dave does not like beetroot in any form or manner, unless it is roasted, and this seemed like the perfect time for me to make this dish, as he would not be sharing it with me. Is there something you love to eat that your partner doesn’t? This was an awful experience! 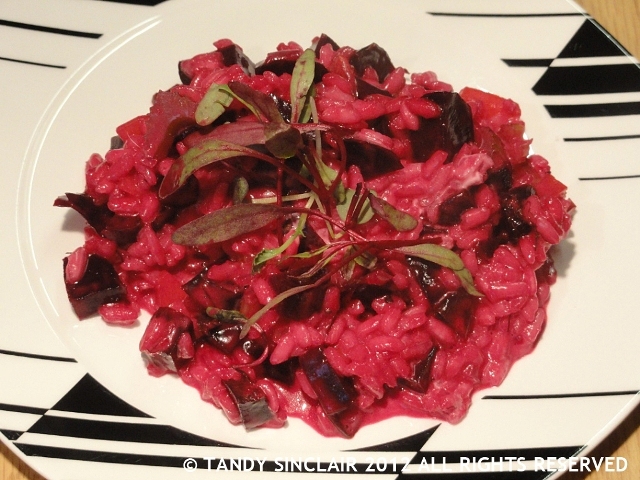 The beetroot risotto looks perfect! I love home-made beet risotto’s a lot. Yours looks superb! 🙂 Yumm! Oh, this sounds like a scary experience. It is difficult to say something when an ‘expert’ tells you that you are wrong. Well done Tandy. I love beetroot and I add them to my open face panini mixed with mayo. I’ve never try risotto…nice colour. My husband eats only chicken breast, I rarely cook a whole chicken because I have to eat most of it!!! Hey Tandy!! Sorry to hear about your unfortunate experience! I’m glad you were at least able to get your refund!! 🙂 Anyway, this beetroot risotto looks really good!! mmm! Would definitely love to try it! What a drag but it seems that the silver lining here is the AMAZING DISH before us…looks fabulous and I feel like I can smell it from here! Tandy what a pain that all sounds, especially for something as important as your eye sight. I’m glad to hear it’s all getting sorted now though. Delicious, by the looks of it! Love the color! What a great way to use beets! I love “tomatada” (a dish with ripe tomato sauce and poached eggs), he doesn’t. I love that dish as well! As with any beet recipe, love the color but not a fan of the flavor. Great post! Love the new header Tandy! It seems your patience was well and truly tested. Don’t you sometimes just want to stand and scream? Lovely risotto, such a pretty colour. I hope the glasses will be right this time Tandy. I know I cant get along without my reading glasses so I can just imagine how frustrating this must have been for you. The food, as usual looks delish! We both love beetroot, and this looks wonderful, Tandy. I adore mushrooms, but hubby isn’t mad about them, so when i make them, he only has a few, and I get the lion’s share, which suits me fine. 🙂 Hope your new glasses are perfect. What a sorry tale! I am sure you are more than happy to be eating all the mushrooms 😉 my new glasses are great, thank you! My OH inexplicably doesn’t like pasta or potatoes (unless fried or roasted) which I find very frustrating. Each to their own I suppose. Actually my mum detests beetroot so we never had it growing up and I am a bit of a late comer to it. That risotto looks delicious though. I also LOVE your new Lavender and Lime banner photo. It is new isn’t it? Or am I just unobservant!